LOS ANGELES, Calif. /California Newswire/ — Former Los Angeles County Sheriff Leroy “Lee” Baca, who retired as the top law enforcement officer in LA County in 2014, was appointed as a professor announced the University of Los Angeles College of Divinity in Compton, Calif. (ULACD). Ironically Sheriff Baca was previously responsible for the LA County Sheriff’s department taking over the policing in Compton from the local Compton Police department in 2000, saving the city over $8 million. Sheriff Baca has served as a college professor previously both at Cerritos College and the University of Laverne. He has earned two advanced degrees from USC; a M.P.A. in 1974 as well as his Doctorate, a D.P.A. in Public Administration in 1993. Dr. Baca also possesses a Credential in Vocational Education from UCLA, which was earned in 1972 after earning his B.A. in Administration of Justice from Cal State Los Angeles in 1971 and his A.A. degree from East LA College in 1964. Additionally Baca was in the United States Marine Corps as a reserve for six years. “Baca is a gifted teacher who has the rare ability to take the most complex subject and make it seem simple,” stated ULACD Vice President of Academic Affairs, Dr. Michael Miller. “The Sheriff has learned how to change the behavior of people by making teaching small. He is gifted at taking the big and making it small he has changed dynamics within a work force of over 18,000 people. He has demonstrated a capacity to connect at many levels of government and to diverse groups of people. These same skills will greatly benefit our students and the community we serve in Compton, Watts, South Central Los Angeles and parts of Long Beach, as a University,” Dr. Miller emphasized. Sheriff Baca grew up in East Los Angeles and graduated from Franklin HS as the senior class president in 1960. Baca was uniquely qualified to be sheriff of LA County after having served or supervised in 19 different assignments (almost every Sheriff station in L.A. County) during his 49 year career in the Sheriff’s Department. Baca’s legendary career started as a sworn deputy in 1965. Baca was appointed to Sergeant in 1970 and Lieutenant in 1975. Baca served in or supervised in 19 different assignments (almost every Sheriff station in L.A. County) during his career. He made Captain in 1981 and Commander in 1987. He ably served former Sheriff Sherman Block as Chief Deputy for six years from 1992 until his election as Sheriff in 1998. Sheriff Baca served 15 years as Sheriff and the top law enforcement official in Los Angeles County. Sheriff Baca lad the expansion of the Sheriff’s department and was responsible for not only taking over the Compton Police department, but also the Metro Transit Authority (MTA) police department and the Los Angeles Community College Police Department. These actions saved LA County and the City of Compton untold millions of dollars. Lee Baca served with great distinction and was responsible for developing the Core Values Statement of the department, which helped create a better understanding of how precious the value of human life is. “Sheriff Baca believes that fundamentally that there is a greatness to every human being and that God is involved with every person’s life weather they think so or not and this belief makes him a perfect teacher and role model for Christian students,” explained Dr. Miller. The University of Los Angeles’s mission is to teach and train servant leaders to excel spiritually, intellectually, and practically in the ministry and selected lay vocations. Our Christian College exists to help building the Church, advance the work of God and impact society through embodying excellence in programs of Christian higher education and development in Christian faith, thought and practice. – We nurture the talents of each other. – We inspire a sense of responsibility for each other. – We challenge each other to embrace diversity. – We motivate each other to respond compassionately to the needs of others, especially the poor. – We provide exceptional and unparalleled programs to students of all diverse intellectual and academic backgrounds. – We set high standards for each student through individualized and advanced curriculum. 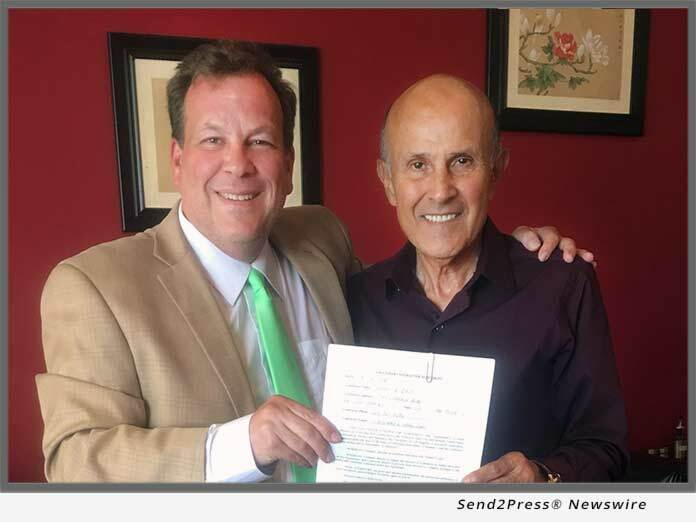 Web photo caption: Former LA County Sheriff Lee Baca and University of Los Angeles College of Divinity Vice President of Academic Affairs Michael Miller after signing Volunteer Agreement to become a professor at the Compton institution.